Four elections and a referendum: It’s been a helluva five years. With the new SNP Government now sworn in the party can at last move off a permanent war footing. It’s time to take stock, re-group and plan. And what a change in the political terrain has taken place. The Labour heartlands are no more. Once the party of the working class, Labour is now only capable of clinging on to constituencies that contain a substantial liberal middle class committed to voting tactically to keep the SNP out. And the SNP, although still able to straddle the class divide in its appeal, is now without doubt the political representative of central Scotland’s working class communities. 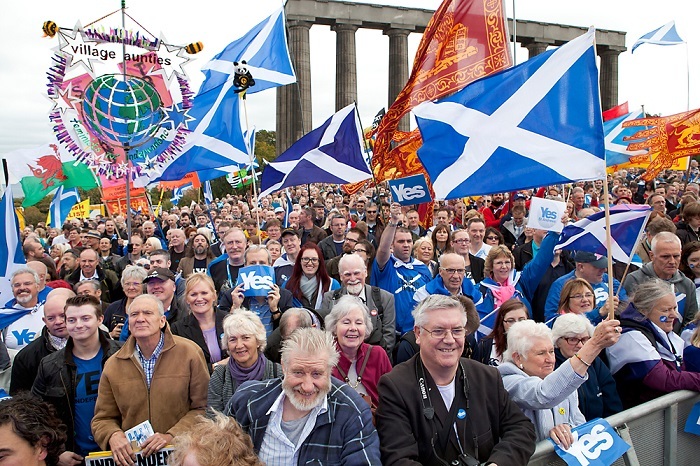 The turbulence of the referendum has settled to create a new political schism in Scotland. Where once the battles between left and right and between nationalist and unionist had separate, if inter-related, narratives, now they have almost completely overlapped. Scotland is now politically aligned with a left of centre majority espousing the road to independence and a right-of-centre opposition eulogising the Union. Support for public services, the fight for equality and a fair redistributive tax system are now synonymous with self-government, whereas low taxes, public spending cuts and inequality are identified with Unionism. That’s a split I like; because that’s a battle we can win. The first consequence of this new political reality is that Labour have not yet hit bottom. In the Venn diagram of contemporary Scottish politics the overlap between Unionism and socialism is smaller than ever and if Labour cannot, or will not, break out of that space it has further still to fall. It isn’t enough to say the constitution is a distraction. In the contest between a left of centre Scottish Government pursuing social democratic objectives and a Conservative and Unionist Party trying to stop them, sides will have to be taken. We now have a situation where the SNP has convincingly won every electoral contest in recent times commanding the support of up to half of the electorate and yet it’s central proposition of Scotland becoming an independent country was rejected just 21 months ago. The Tory claims that the Scottish Government does not have a mandate to ask people about their own independence again are nonsense. The SNP were elected saying that in certain circumstances there could and should be a second referendum. But unless things change there’s little point asking the same question only to get the same answer. Sometimes things change in spite of our best endeavours. And sometimes we have to make our own history. That’s what this summer’s launch of a new campaign for independence is all about. Changing the terrain, moving support for independence from 45 to over 60 percent. It would be wrong to think of this as a single event. It has to be a multi-faceted process, reaching out and engaging with those who voted no last time. There will be some who we will never convince, whose minds will be closed to dialogue, but they are the minority. There are a great number of people who voted No but could be described as i-curious. It wasn’t that they would never consider the idea but the time wasn’t right. They worried that we couldn’t afford it, or that others would sabotage the endeavour. These are our audience. Part of this exercise needs to be introspective. Whilst I’d hate to see us just talking to ourselves it’s right to take time to look at what we can learn from the experience of 2014. We need to revise the offer – partly because there might be better ways of putting it, but also because the world has changed. Major policies need to be revisited. Is it credible to argue for a sterling zone when the biggest player says no? Maybe it is, maybe bluffs need to be called. But maybe we need a better plan B, the existence of which might well make the UK exchequer take a different view anyway. And we need a new energy policy centred on making Scotland Europe’s renewables capital. It was the No campaign who claimed Scotland’s independence was predicated on the barrel price of oil. It never was and it’ll be even less so next time round. Perhaps most of all we need to tackle the slur of separatism. This was used by our opponents to suggest that Scottish independence was a desire for isolation, building barriers between the peoples of these islands, crudely suggesting that xenophobia was at its heart. The Yes campaign countered these arguments but we failed to reach enough people and the dirt stuck. Central to our next campaign should be the argument that independence far from separating Scotland from the rest of Britain, or the world, is our route to participation in it. This is the means by which we can practice real solidarity with people elsewhere on the planet. In fact it is the Union, and the constant requirement to communicate with the world through the prism of London, which keeps us separate and denies our potential contribution to the world. We also need to examine the entire area of economic equality and public services. Here, perhaps more than anywhere else, we need to distinguish between powers and the political choice to use them. It’s a tricky one. I, for example, don’t have a problem with having Scandinavian levels of tax to fund Scandinavian levels of public services. I’d like to see the public realm account for closer to 40% of GDP than the 35% it does at the moment. But, I wouldn’t make that a pre-condition to voting for independence. It’s the right to choose that’s important here – not what we might do with it. In areas like this the actual administration of devolved powers can be used to illustrate their shortcomings and why, rather than piecemeal devolution, independence is a better way of government. For example we know that the ability to increase income tax rates for the super-rich is a con as they can simply pay themselves a different way. So unless we have control over the taxation of all income, including dividends, then we really have control over very little. Now, there may or may not be a majority for implementing a 50% tax rate, but I think the choice ought to be available to the Scottish Government if it so chooses. And so independence is the answer to one of the many inadequacies of the current Scotland Act. The demographics are with us in this journey. One of the most important groups of people who rejected independence were the over 60s. They were the children of the 1945 Labour government. They saw the creation of the NHS. They were beneficiaries of the Wilson expansion of education. For many the Union had a positive balance sheet with their own experience trumping Thatcher’s cuts and Blair’s illegal wars. But time moves on. Memories fade, people die. The next time the question is asked the negatives of the Union will outweigh the positives for more people. All of these topics need discussed with the vast array of organisations and experienced people who have a stake in them. In the process we may improve our plans and win support at the same time. It means the SNP understanding that it is leading something bigger than itself and being prepared to engage with those outside its ranks. Structures can be loose and timescales flexible, it is the process of reaching out that is the most important. Paradoxically, a renewed debate on what independence means and how to get it could also energise the party itself. Around 100,000 people have joined the SNP since, and mostly because of, the referendum. They are a tremendous resource. Their expertise, knowledge and wisdom can be harnessed by the party to shape a prospectus practically rooted in experience and garnished with collective ambition. Remember how you felt in the summer of 2014. When it looked like we could win. When because independence was possible, everything was possible. Remember the creativity, the excitement, the energy, the ideas? Well, now’s the time to harness that again. Now there’s somewhere for it to go that’s not just about winning elections, but drawing up a plan to change the world. This article was first published by Tommy Sheppard on his own blog here. Republished with kind permission. Can I just say that I’ve never seen a more appalling statement, Mr Sheppard. And I voted YES. There were several points made but you haven’t said what was so appalling. No, he was simply stating a fact of life, or rather death. The big question though is whether this opposition to indy is a characteristic of people born before a certain date, say pre-1955, or whenever; or whether it´s rather a characteristic of people who have reached a certain age. In the latter case simply letting time pass will not help because as younger people age they will, in this scenario, become less inclined to back indy. And negative for other UK and EU- born voters. I’m over 60 and I’m entirely comfortable with the statement. It would only be controversial if it were a wish for older voters to hurry up and shuffle off – not a statement of fact. The demographics just can’t be ignored. Another 4 or 5 years of younger voters joining the electorate could be worth a few points to the YES side. Many older folks will always be harder to convince for a number of reasons. They were brought up under direct London rule with no Scottish parliament; they are less likely to be on the internet; and the NO voters are constantly replenished by retirees from south of the border. And what currency will we use in an independent Scotland? If Tommy is not prepared to engage with the difficult questions, then this relaunch will just be treading water amongst the already converted (though probably still better than what Hosie would have delivered). The SNP has achieved success for two reasons: by being more competent than post-Blair Labour, and by separating voting for the SNP and voting for independence. The latter is both good and bad. The former? I think the political wheel now turns more quickly. If the SNP (hello Mr Hosie) loses touch with the electors the way Labour has then it will fall as or more quickly. For me the current test is ship to ship oil transfer in the Cromarty Firth. Quick profit for the port authority or risk of long-term damage to the environment and wildlife tourism? The SNP needs to speak up. This reads more like a fairly broad brush, back-of-an-envelope political party strategy piece than offering any real vision or passion for our nation. Lets face it, the 56 ‘roaring lions’ settled in to Westminister when they should have settled up. The weekly ‘Scottish Questions’ theatre show excites nobody outside the political bubble and achieves precisely nothing. While SNP politicians concentrate on their ‘careers’ for 5 years, Rome continues to burn. What was that saying about patriotism? I believe our own currency would be best in the long run. But most mortgage payers will shiver at the prospect of their debts being in a foreign currency. Salmond got it right politically last time. It is true that 2014 No voters are dying faster than 2014 Yes voters. But the arguments will have to be won again in a new context. Salmond gave the unionists a gift – the chance to call his bluff on Plan A. There was no Plan B. Had Yes Scotland been stronger, I think we would have seen Plans B through to D or E, but that organisation was too tightly whipped. Interesting article but it doesn’t take a genius to see that Tommy is making a play to put himself in the now empty Hosie seat, coordinating the SNP referendum reboot this summer. Don’t get me wrong, I enjoy Tommy’s speeches in Parliament and he’s made a good start – he’s a good orator, intelligent and passionate. However, I think a wee bit of humility might be in order – don’t think he’s been in the party long enough or ‘earned his stripes’ to lead the referendum reboot quite yet. So maybe a bit more humility needed for Tommy and a few more years’ hard graft before making a play for the top. Bloody politicians! I don’t know if this is an official appointment, or an unsolicited job application, but from what I know of Tommy’s politics, I wonder if we don’t also need a centre-right wrangler to complement him? Again, going back to the post-referendum results, it was the higher income groups that often voted No. Rather than another run at lower income voters, who do seem to be persuaded, don’t we now need to connect with these professional groups? A Swinney or Ewing (F), setting out how an independent Scotland will be a place in which personal (or even large-sized) aspirations can be realised might be more to the point. I wouldn’t roll out McColl – I think you need to have thrown in your lot to be credible. I voted YES and am 67 and still alive (or so I am told)! Throughout the time of my political awareness I have been a supporter of independence. My conviction has been strengthened during this time and my wish is to witness my status as a SCOTTISH citizen. I grew up with the notion that Labour was “the party of the working man”. In my earlier years I was a “long-term unemployed” with all the approbation that this working-man party could deliver. To take a deep breath and consider the world I lived in was a revelation as a young man. Hope this old fogey makes it to the line! Just discovered, Tommy, you are only 10 years my junior! Any relation to the Tam Sheppard who used to have the joke shop in Glasgow’s Queen Street? Grow up, son. Hope to see you in an independent country. Splendidly written article Mr Shepherd , you write as good as you speak , and you surely need a more prominent position in the party . I hope you will stand for deputy leader , and take up the challenge later in the summer to relaunch the campaign . I will grant you Tommy Sheppard talks a good game but I reckon after a few halfs and in company he trusts he would admit a deep pessimism; because he does not believe a word of the above. His reflections on The Summer of 2014 already sound like a passage from Brigadoon. His claim that “the demographics are with us” are meaningless. Yes the majority of over 55s voted NO and yes if they all die off (in 30 years time) the vote in a second referendum might be different. But what Tommy omits to say is that a second referendum needs to be called before it is won. This is a rather obvious fact nationalists will not face up to. The one last hope is a Brexit vote. That is unlikely but not impossible. If it is a vote to Remain, as the SNP are campaigning for (funny thing politics) any prospect of a second referendum are as slim as my wallet. Cameron/Mundell/Davidson/Rennie/Dugdale/Foulkes/ to name but a few of our unionist countrymen will never tire of explaining to those that don’t understand, the union is safe, forget about independence, its over. In fact I believe the message is going to be a lot louder and much more assertive. They cannot wait for 26 June to explain something that some nationalists don’t understand (although I don’t think Tommy Sheppard is one of them), that is the referendum of 2014 not only secured the union, it strengthened it. I do confess to being an admirer of an eloquent speaker, and Tommy will find greater fame as a public speaker in years to come,I am sure. I also agree there is a woeful lack of detail , and harking back to the Summer of 2014 , may well be a bonding experience , for others on the “NO ” side , it was fraught with tension and anxiety . To challenge the strategy would cause deep disruption in the movement , but it will have to be done, what no one acknowledges, is that for every voter converted , another was dissuaded . As opinions intensified and entrenched , you are right it actually strength ed the Union. The Ashcroft polling is available online, and I think has to be addressed by anyone thinking about restarting the public campaign. From memory, economy including currency, shared culture and tax were the threr most important reasons for no voters. No voters in the poll were also much more likely to have made up their minds early in the campaign, so this won’t be a quick effort, or a few soundbites. It will need getting alongside No voters and understanding their worldview. I dont know what your talking about. Read it twice. You don’t make sense. Lets talk after 25 June. Im sure things are going to be a lot clearer. Regards, R.
Can you briefly explain your assertion that the 2014 referendum strengthened the union? Surprised to see that written. Even commentators like Effie Deans continue to devote pointless bytes of shrill content in an attempt to safeguard it’s continuance. It is a pity tommy shepherds article is being talked about for one small section of it , I personally think Tommy has just stated the bleedn obvious , most older people digest the news presented to them from the BBC Daily Record etc and for the most part are oblivious to what has actually happend since the referendum and a whole lot of people not just the elderly truly believe the Vow has been delivered and the SNP are just trying to be awkward this just shows how the media in general are working to conceal and so far quite successfully the undelivered Vow . Having listened to Tommy on a fair number of occasions i bet he meant no offence to anyone in the statement he made and would be the first to apologise if anyone took offence . I had a conversation in a pub with roughly 8 people in my group. 6 Were definate no’s fundamentalists, one had voted yes but was swithering maybe peer pressure. The 8th said it just wasn’t the time or the time was not right. That there number 8 is our target group. It’s economics that get these people to vote yes. They are probably just as patriotic as me! In the first 6 was an English guy who was smug and thought he was operating on a higher plain than me. Fundamentally he said he wanted to protect his nationality. I explained that he was English and would always be so no matter what country he lived in, so what was he scared of. The British nationality that was it. He viewed Scotland as part of his country like Yorkshire. These types are not worth the oxygen. Arrogant plantagonists! The switherer thought that the oil crisis had destroyed the argument. Have you ever tried to explain fiscal economics when you are outnumbred 8/1. In the end I said the table did not accurately match or reflect how Scotland had voted. So it was unfare to have 8 people all agreeing with each other for different reasons. The final insult was Scotland voted no so get on with it. I asked if that meant the 45% had to just be ignored and left to rot ……….silence. For Yoons democracy is about winning at all costs and binning anyone who doesn’t agree with you. I do fear for the switherers who might now drift away though. Tommy doesn’t seem to have bothered to look into his own parties tax and spend policies for the decade. Is at total brass neck or is it utter delusion? Tommy, you’re just a facade for sometimes centre right, sometimes centre left nationalist party. If Scotland were genuinely about redsitribution and ending inequality they would have vote for RISE or another genuinely left party. Oh and it’s not a battle you can win because despite the rhetoric, as we have repeatedly seen, Scotland is no different from anywhere else. Talks left acts right, and the middle classes far out number the working classes. – Tommy thinks questions were ‘debunked’ (hence dead issues). errr, no. – Hatred of Britain and all things British works *against* converting any non-mouthbreather. 45% was probably peak unless SAS invades.